This is the second in a series of articles that will look at what makes memes go viral, as well as how we’ve ended up using them to communicate. You can read part one here. Humor is easily the most important aspect of a meme. If it’s not funny, there’s no joke, and therefore no meme. Memes are fairly simple to create, but it’s the humor behind it that really sets the memeage into motion. Memes represent every emotion on the spectrum, from anger to anxiety and depression to joy. No emotion or situation has been left unmemed, which is important given how vital memes have become to communicating in the modern world. Memes are easy to recognize. This is a large part of why visual memes like the Bee Movie are so popular. There’s a distinct image or character that can be represented in various ways. It’s the same with the Lightning McQueen memes. If someone who’s in the know sees that distinct red racing car, they know they’re in for a good laugh. “Older memes like Pepe the Frog and troll face, they’re still funny but they kinda die out,” Eldredge adds. He then went on to explain the concept of meme calendars, which he believes is the reason so many memes nowadays are losing traction. 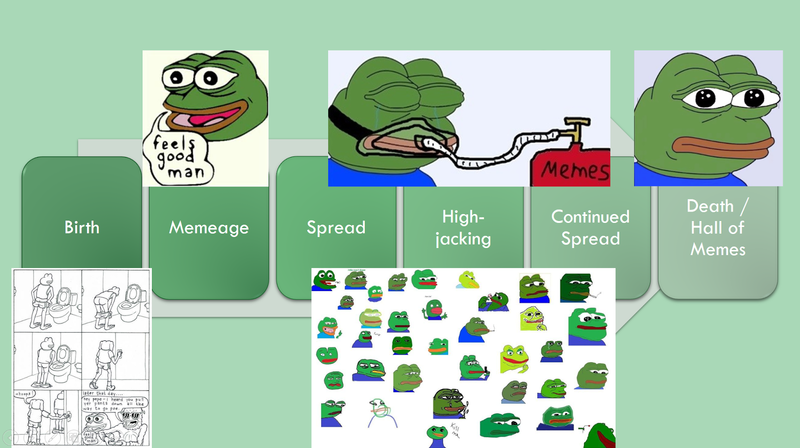 “There’s a decline in memes because people are pushing too many out [in an attempt to make it on the calendar], and they all die too quickly,” he continues. Eldredge’s claims are hard to ignore. New memes are born nearly daily, but only a few have the strength to carry on the legacy that memes before them had. At the time of writing, Twitter was obsessed with that screaming Meryl Streep image. Facebook is still churning out minions and macros with a fervor, and Instagram is still screenshotting those and sharing them with hashtags. Tumblr’s doing... well, Tumblr. The point is memes are just as varied as the people and places that share them, something we’ll look more into in the next installment.